In 1978, Larry McEnerney, AM’80, then a humanities graduate student, was hired to help teach the first version of what would become the Little Red Schoolhouse writing course, under the direction of professors Joe Williams and Greg Colomb. Now director of the Writing Program, McEnerney splits his time in the classroom between the writing course and undergraduate courses in the HUM and SOSC cores, for which he earned a Quantrell award in 1997. 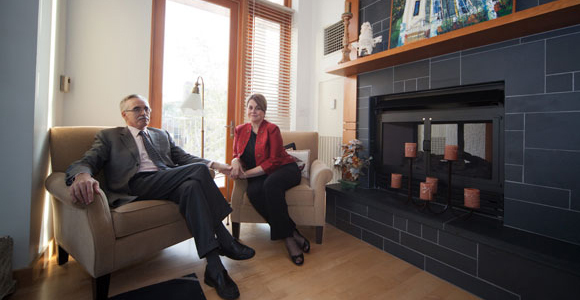 He and his wife Cathe serve as resident masters in the South Campus Residence Hall. Why are there so many bad writers? Isn't everyone in college already supposed to know how to write? The idea that writing is a basic skill—that it’s reading, writing, and arithmetic—is really inadequate, and in some ways even contributes to making people bad writers. In high school they’re just pretending to do things with their writing. It’s as though somebody trained for 20 years in a sport without ever competing in the sport, and then they were suddenly called on to do the sport really well. I don’t think it would surprise anybody that they would have trouble. You were there for the lectures that inspired Little Red Schoolhouse. What were they like? Joe used to say they got $25 from the dean [Professor Jonathan Z. Smith] to put up stickers around the campus that said “Lecture on Writing” and a time and a place. And then 200 people showed up. So they decided to have a class on it. And the story to me is still absolutely astonishing. They committed to teach the class in the winter quarter [of 1980] before they had a curriculum set. So how did they prepare? They hired 12 graduate students to teach writing workshops, and in the fall of ’79 did a training program. It was perfectly clear from the first night they were making this stuff up as they went. Joe was drawing things on the board in front, and Greg would be in back of the room saying, “That’s crazy, that’s not the way it works!” They would go at it, and the 12 of us graduate students, and Frank Kinahan, would look at each other thinking, “We’re going to have to teach this?” It was fascinating, and it was intellectually invigorating. And it worked. What were your first writing classes like? How is teaching in the humanities core different? The Schoolhouse is ruthlessly pragmatic and is a specific solution to a specific problem. In the HUM core, there are so many other things on the table. When we’re reading Nietzsche or Thucydides or Shakespeare or Tolstoy … there is so much more to talk about and the issues are so much deeper. We can get at philosophy of language, we can get at a lot of ethical issues, we can get at what counts as understanding. Do you really speak about the Gettysburg Address during every family weekend? Yes. I’ve got a bust of Lincoln on my shelf at home because the Gettysburg Address and the Second Inaugural are the two texts that I’ve analyzed the most closely. What is your favorite writing rule to trash during your lectures? Undoubtedly the whole passive verb rule. A lot of bad stuff comes out of that rule. Is there a danger that people will take the Schoolhouse ides and make them into rules? We spend a lot of time in the Schoolhouse telling people that we’re not giving them an alternative set of rules, we’re giving them tools for predicting where their readers are going to struggle. Besides teaching and serving as resident master, how do you stay busy? You taught a course about Reagan's and Obama's speeches last spring. Why? I started thinking about it in 2008 during the campaign, when I was listening to Obama’s speeches and thinking, “These are amazing and I don’t know what’s going on, but I feel like something is going on here.” Obama led me to Heidegger in one direction and to Reagan in another, and then Reagan led me to Locke. That must have been quite a course. I say this to people and they think it’s just boosterism, but I can’t imagine other schools where you offer a course—and it wasn’t advertised, it was just word of mouth—that demands people on the one hand write speeches once a week, and on the other hand read Locke’s Second Treatise and Heidegger’s Being and Time. And you have people pounding down the door to do this. McEnerney (with wife Cathe) takes a moment to recover from reading so much bad writing.